I never feel like I’m getting a good price when I buy airplane tickets. Do I buy through an agent? Do I buy through the airline’s website? Do I get them six months in advance or six weeks? Whenever I finally click the purchase button I know that there’s some secret handshake or coupon or magical elf that could have gotten me a better deal. Maybe I just need to learn to only be interested in things that are within walking distance of my house. I do love the windows. Not pindows and wictures, but windows. I’ve never bought aeroplane tickets before. Never been on a plane, either. I’ve only ever been on a train when going to a holiday; I had about 1 day of a 2 week holiday left when I arrived. I’m not certain how I feel about the implications of this strip. Plus, you won’t have to hear that collicky baby with an ear infection in 23b. Yes, we can see his eyes in one of older strips..The one, where he is sleeping and his eyes are floating in a glass of water on a table. and he still has the eyebrows attached?? Well at least he can still see Paris. Obviously the TSA did not leave much of him left after they were done searching him. I was more surprised by the fact that he actually had eyes than that they’re green. <.< Theres something on the wing… some. THING. Priceline Negotiator! Being a Trekkie, I always enjoyed the Priceline commercials, and usually check their site first for stuff before going to somewhere else. If you think the planes are expensive wait until you see the price rates for magic elves! Ah, the Thing on the Wing — love the old Twilight Zones, even the hokiest ones were better than everything else! We need them back! I kinda hate planes. Yes, they’re technological marvels and I geek out every time we take off, but I always get close to freaking out halfway through the flight. Man was not meant to fly…that way. Give me a jetpack. Hmmm…. I’m going on my first plane ride in February next year. Trip to Poland, £560-ish for plane and hotel. School trips rule. If anyone goes to poland in Feb 2012, from the UK, on a plane full of schoolchildren (*unlikely*) I will be the one screaming extremely loudly. EXTREME fear of heights. Maybe it was a bad idea to sign up for this tortur- err… FUN? 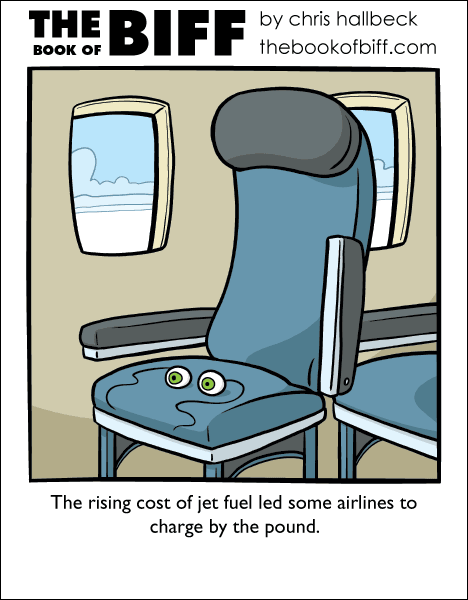 English airlines are charging by the pound already! Boom-boom, one in a row! Ahthankyou, I’ll be here all week!